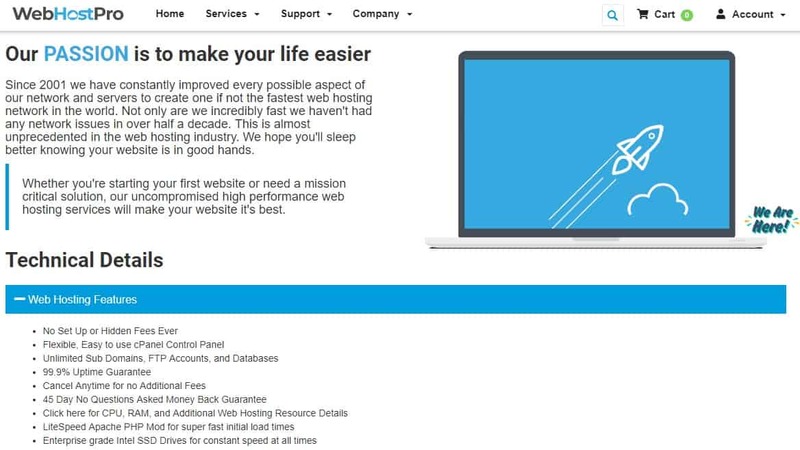 Web Host Pro Review 2019: Is Web Host Pro a Good Hosting? Web Host Pro is a U.S. hosting firm that offers an array of internet services including shared hosting, reseller hosting, VPS, dedicated servers, and domain registration services. Established in 2001, this hosting company was initially registered as DWHS but changed its name to Web Host Pro in 2012. Today, this company has created a noteworthy space for itself in the hosting industry with its over 50,000 customers from various countries the world over. The vendor’s hosting solutions are powered by two data centers in the United States. Web Host Pro hosts more than a million domains and has extended its reach to some unlikely places, including countries like China, Taiwan, Lithuania, and South Africa. Web Host Pro servers are housed in its premium data centers located in Las Vegas and Los Angeles, in the United States. The data centers feature CRAC units, Uninterruptible Power Supply (UPS), and independent distribution routers in addition to a bandwidth capacity that exceeds 250 gigabits/second. This provides a high capacity hosting environment and virtually unlimited scalability. Additionally, this vendor’s servers use enterprise-grade intel SSD drives ensuring fast loading speeds of upto 20 times faster than websites hosted on HDD drives. What’s more, the vendor has deployed LiteSpeed Apache PHP Mod to further improve its server loading times. Web Host Pro performs regular backups ensuring your website data is always safe and can be easily retrieved following a data loss event. However, it is important to keep in mind that it does not backup old emails. For clients who want backup solutions with a further reach, Web Host Pro has partnered with a company that does server cloning producing alternate copies of existing infrastructure. Web Host Pro hosting plans are very cheap yet they have quite a noteworthy number of features. This vendor has adopted a straightforward pricing model with its monthly billing cycle and no hidden charges. What’s more, for customers who commit to a longer contract — six months or more — the vendor offers very discounted hosting prices in addition to a free domain. This hosting company guarantees a 99.9% uptime guarantee but claims that its uptime has never gone below 100% since 2011. However, a number of its customers have complained that the vendor has on several occasions gone below that uptime due to software and hardware upgrades without communicating effectively to customers about the planned maintenance. For new customers, Web Host Pro offers a risk-free 45-day money-back guarantee, no questions asked. Call or send an email to Web Host Pro if you have any query about its services. You can also reach out via the ticketing system or through live chat support. I tried contacting this vendor via its live chat but received an automated message telling me that the support team was busy and unavailable at that moment, advising me to open a ticket instead. 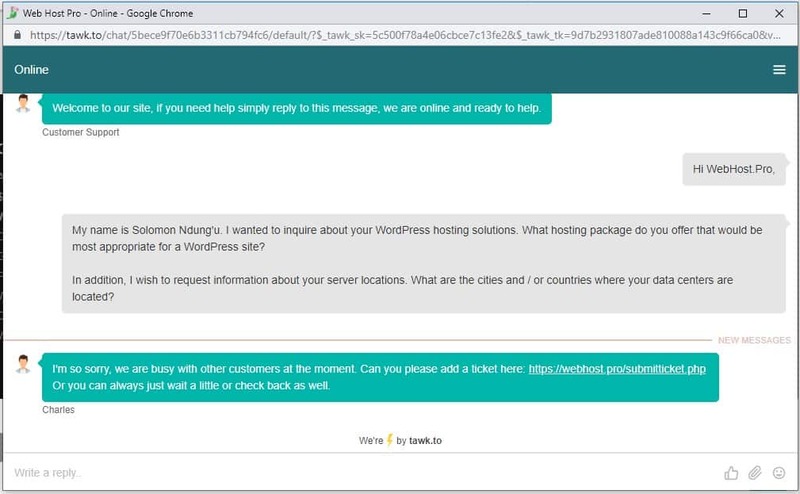 I opened a ticket via the vendor’s website contact form looking for information about its data centers and WordPress hosting solutions. I received a response around five hours later. Web Host Pro has a fairly comprehensive knowledge base, FAQ section, and some video tutorials, as well. Web Host Pro has invested quite heavily in its hosting infrastructure to deliver reliable, time-tested hosting solutions for businesses in many countries across the globe. Its 100% uptime since 2011 is a clear sign of its commitment to delivering high quality hosting solutions. Wondering how Web Host Pro stacks up against other Web Hosting companies? Enter any other Web Hosting company and we will give you a side-by-side comparison.